How to Stay Productive in 5 Easy–Hey! The Super Bowl! You get it. The Super Bowl is on its way. I’m not above it. The two final teams are my two favorite teams (NOTE: I was as loyal to Indianapolis as I will be to Denver). So this is all pretty fun. Now ends my talk of the Super Bowl. My 22 credit course-load is proving difficult these days; I haven’t even attended every class yet! However, instead of traversing down a dark and dangerous road which ends with me mounting a soapbox, screaming about the cruelness of time, I thought I’d instead share some great things I’ve learned and experienced, so far, from this new semester. First, I discovered the greatness of Flannery O’Connor and her short stories. Specifically, I read one entitled “A Good Man is Hard to Find.” It is good when words on a page can move you to feel something unexpected. SIDE NOTE: Raymond Carver is exciting as well. Last weekend, my wife and I watched the movie “Her.” A bit melancholy. Actually,the film was entirely melancholy. You could call the tone a one-note taste buffet. That said, the performances were great, the colors and music delightful, and we walked out with plenty to talk about. Is our every action and thought ruled by some form of egoism? The question was posed by my Business Ethics professor, and I’ve been thinking plenty about it. (For instance, can altruism be ultimately motivated by our own self-interests?) What do you think? Any takers? Finally, my friend Jeremiah sent me a link on Facebook about a Christian website trying to raise funds to ship bibles to the Typhoon Devastated Philippines. Just throwing this out there… maybe start with food, water, and shelter? Any other thoughts on this? Hmm. I think we have some things in common, sir. We are both Colts and Broncos fans and even bigger Peyton Manning fans. Jim Gaffigan is indeed humorous. 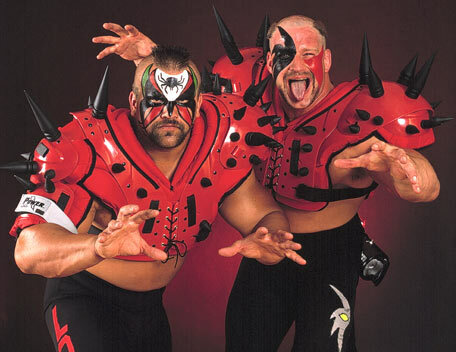 And–God!–who didn’t love the Road Warriors! We are eerily similar! Sweeeet. Now come to upstate New York and let’s get coffee already. 22 credits? did you drink the crazy juice when you signed up this go-round? Sheesh! Just a little bit of crazy juice. Nothing out of hand. Oh yeah when did you stop being a Colts fan?? Seahawks are my #2 team well so I’m puuuuumped! Wellllll, I stopped being a Colts fan after Manning left. My fandom was generally always a surface-y one (Considering I had never stepped foot in Indianapolis). Tony Dungy, Marvin Harrison, Edge James, Bob Sanders also made the team worth rooting for, but they all left too. I still root for the Colts in most games, but I don’t really “follow” them like I used to. I tried to be a Dallas Cowboys fan when I lived there, but they made it so hard… Now I’m married and my wife knows and cares nothing about US sports. I watch fragments of basketball and football when I’m at the gym. 22 hours is absolutely a full-time job. Weren’t you working as well? My wife has officially converted to sports. The other day we listened to sports radio in the car and it was awesome. On another note, yes I’m also working. I have a new job as a mentor with high-school “at-risk” youth. Haven’t done much yet, but I’m excited to get going! If nothing else happens in your busy schedule but that you discovered the greatness of Flannery O’Connor, your time will have been well spent.